Solitary fibrous tumor (SFT) is a noncancerous tumor of the lining of the lung and chest cavity, an area called the pleura. SFT used to be called localized fibrous mesothelioma. The exact cause of SFT remains unknown. This type of tumor affects men and women equally. About one half of the people with this type of tumor do not show any symptoms. The diagnosis of SFT is difficult compared with the cancerous type of this disease, called malignant mesothelioma, which is caused by exposure to asbestos. SFT is not caused by asbestos exposure. Treatment is usually to remove the tumor. The outcome is expected to be good with prompt treatment. In rare cases, the tumor may return. Fluid escaping into the membranes around the lungs (pleural effusion) is a complication. Call for an appointment with your provider if you notice symptoms of SFT. Myers JL, Arenberg DA. 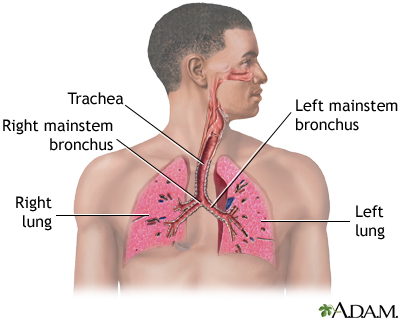 Benign lung tumors. In: Broaddus VC, Mason RJ, Ernst JD, et al, eds. Murray and Nadel's Textbook of Respiratory Medicine. 6th ed. Philadelphia, PA: Elsevier Saunders; 2016:chap 56.